I capture a moment in time with a beautifully preserved impression of your child’s hands and/or feet in clay. This treasured ceramic keepsake will be one you can feel and look upon for years to come. It will be a sweet reminder of when they were once so little. These precious pieces make wonderful gifts for mom, dad, grandparents & God parents. Contact me to make your weekday or Saturday appointment. (Address will be provided once appointment is booked- Needham or West Boylston MA available). ​The day of your appointment we’ll pick the colors, designs and personalized details for your tile together. I’ll neatly take the impressions in soft clay and then I do the rest of the work in my studio. The piece will be complete in approximately 4+ weeks depending on my production schedule. For more hand and footprint impression samples visit my Flickr photo site. I’d like to add this to the hand/foot print page after the pricing. I know it will make it a long page, but maybe I won’t have as many back and forth questions from people. 1. At what age can we do impressions? I can get foot imprints at any age, but hands may be in tight fists for a few weeks after birth and around 4+ weeks they start to loosen their grip. 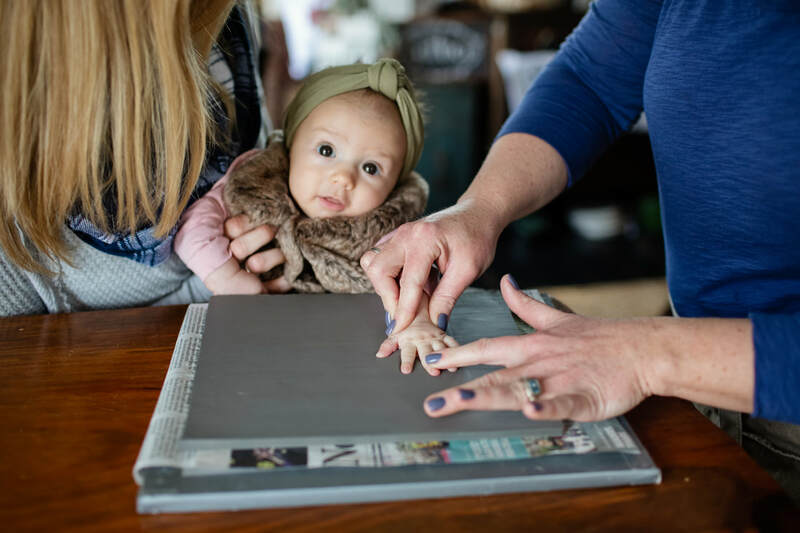 There is no age limit for imprints, but your tile will be larger and therefore may cost a bit more. 3. Is there any preparation for the appointment? I recommend that your little one be rested and lightly fed. Please dress them so that we can easily get to their hands &/or feet to get the best hand and foot impression possible. Also trim nails because it they are long they will show in the imprint. 4. Are your products safe for infants and children? Is it messy? I use a very soft organic, non-toxic, high quality earthenware clay that is safe for your child's hands and feet. There may be a slight clay residue, but a simple quick wipe after the impression is done is all that’s needed for clean up. 5. What should we expect during our visit? 6. When will my order be finished? Typically orders will take approximately 4+ weeks to complete. There is a multi-step process I take the tiles thru including 2 trips thru the kiln. Keep this in mind when scheduling an appt and needing an order ready for a certain date. Once your order is ready, I will contact you and you’ll be able to pick up the order at your convenience from a secure spot at my studio. 7. Will my impressions look exactly the same as the samples? I take great pride in my work however, each plate is uniquely crafted, hand cut & sculpted, hand painted and truly one of a kind, just like the prints themselves. Some glaze colors may have slight variances to them, being lighter or darker than the sample shows. 8. I tried a do-it-yourself kit and it did not work. Is your process different?I use a soft, non toxic clay that is kiln fired, not an air dried. Unlike the do-it-yourself kits, ours will not mold, or deteriorate over time. There really is no comparison between kits and my custom work. Best of all we do all the work for you. 9. What if the impression is damaged during production? Ceramic pieces are very delicate, and sometimes unpredictable. In the rare and unfortunate event that your impression has an imperfection caused by a crack during the drying process, clay or glaze variances, kiln misfires or breakage. I will notify you to reschedule getting another impression. 10. Do you offer group/home parties or play dates? 11. Do you have gift certificates available for purchase? Yes contact me via phone or email and I’ll make a gift certificate for any amount. 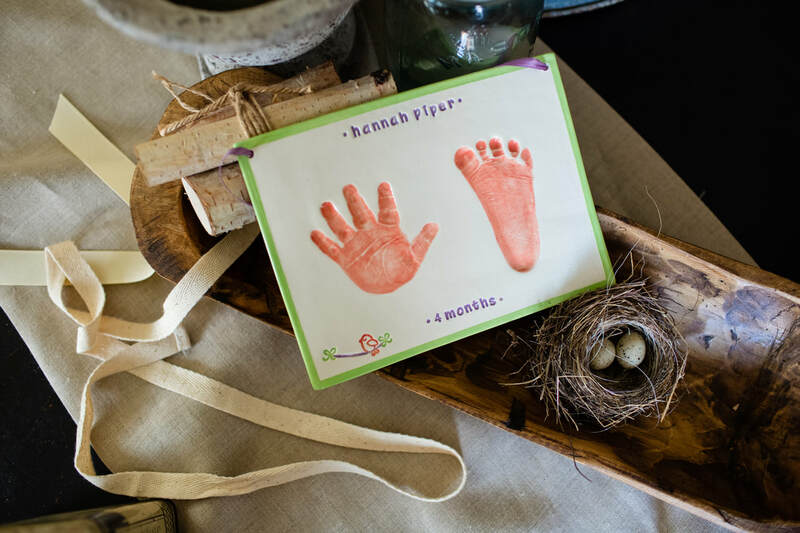 Purchasing a gift certificate is the best way to give expecting parents, new grandparents, a family member, friend, or co-worker a unique and treasured gift. 12. Do you offer discounts for multiple items ordered? Wether I make 1 tile or ten it’s all about the time I spend on the piece/s and doing multiples unfortunately doesn’t equal less time, so I cannot offer a discount, sorry.